Rabbi Chaim Kanievsky was born in 1928 to his father, the famed Rabbi Yaakov Yisrael Kanievsky ("the Steipler"). His full name is Shmaryahu Yosef Chaim Kanievsky. Rabbi Chaim Kanievsky has been living in Bnei Brak, Israel all his life. In his youth Rabbi Kanievsky studied with his father the Steipler, and with his uncle the great Rabbi Avraham Yeshayahu Karelitz, author of "Chazon Ish. He also studied in Yeshivas Tiferes Tzion of Bnei Brak under Rabbi Yechiel Michel Lefkowitz, and later on in the Lomza Yeshiva of Petach Tikvah under the Rosh yeshiva Rabbi Yechiel Michel Gordon and the Mashgiach Rabbi Eliyahu Dushnitzer. In his youth Rabbi Kanievsky studied with his father the Steipler, and with his uncle the Chazon Ish. He also studied in Yeshivas Tiferes Tzion of Bnei Brak under Rabbi Yechiel Michel Lefkowitz, and later on in the Lomza Yeshiva of Petach Tikvah under the Rosh yeshiva Rabbi Yechiel Michel Gordon and the Mashgiach Rabbi Eliyahu Dushnitzer. He has authored many works including: Shona Halachos - a systematic presentation of the popular work Mishnah Berurah, Derech Emunah - on agricultural laws of Eretz Yisroel, Derech Chochmoh - on the laws of the Beis Hamikdash, Shekel Hakodesh - on the laws of Kidush Hachodesh, Nachal Eisan - on the laws of Eglah Arufah, Siach Hasade, and many others. Although Rabbi Chaim Kanievsky's background is of Lithuanian persuasion, he is revered and cherished by every stream of Orthodox Judaism. He is an uncanny Talmudic phenomenon and considered by most to be our generation's greatest scholar and Halachic Posek. Rabbi Chaim Kanievsky receives literally hundreds of queries in person and in the mail every single week from every corner of the globe in every topic under the sun. Every Erev Passover Rabbi Kanievsky makes a festive meal celebrating his annual completion of the entire Torah, including the entire Talmud Bavli, Talmud Yerushalmi, and many other studies. Rabbi Chaim is regarded a holy and sagacious man. Each year thousands of people visit him for his advice and blessing. Rabbi Chaim Kanievsky was married to Batsheva, the daughter of the world renowned Jerusalem sage Rabbi Yosef Shalom Elyashiv, granddaughter of the Tzaddik of Yerushalayim, Rabbi Arye Levine, and a celebrated woman in her own right. Batsheva passed away suddenly during the Succos holiday of 2011. Rabbi Chaim Kanievsky has three sons and six daughters. Rabbi Chaim Kanievsky is an ardent supporter of the Rabbi Meir Baal Haneis Salant charity fund and has consistently encouraged and assisted the organization in every way possible. Jews worldwide fervently pray for the continued health and welfare of Rabbi Chaim Kanievsky. 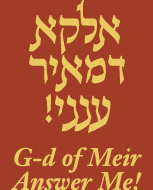 May G-d give him strength to carry on with his holy task of study, prayer, authoring sefarim, and his communal work on behalf of the welfare of world Jewry.